8.F.3 - Interpret the equation y = mx + b as defining a linear function, whose graph is a straight line; give examples of functions that are not linear.For example, the function A = s*s giving the area of a square as a function of its side length is not linear because its graph contains the points (1,1), (2,4) and (3,9), which are not on a straight line. One of the things that help us determine if a graph is a function is to use the VERTICAL LINE TEST. This is where you use a vertical line to see if the graph is "touched" twice. If it is, it is not a function. You can see what it looks like above, but there is a video and website below that can help explain more the vertical line test. 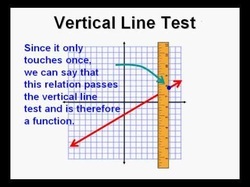 A nice video to the left shows you how to use the vertical line test, and the website to the right, mathisfun.com, explains a little more about functions as a whole and has some on the vertical line test. 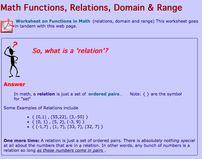 There are several types of functions, as you can see all on this page. The video to the right shows you more about each type. This is a good website where you can go to learn more about functions and have some interactive lessons to test your knowledge of functions.